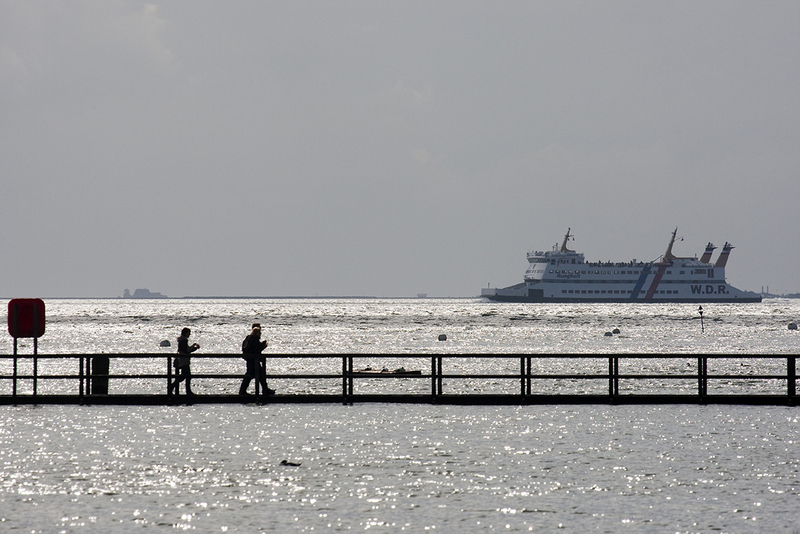 My Wadden Sea photo journey continues southward from Esbjerg and Fanø in Denmark crossing the border to German waters. So, we skip the Danish island Rømø and also pass the northernmost of the North Frisian Wadden Sea islands, Sylt – but both will be featured later in my series. The destination in this second chapter is the two islands Föhr and Amrum, connected to the mainland from Dagebüll with car ferries from Wyker Dampfschiffs-Reederei. I have visited the area three times during the last eight years; The exact period in which Wyker Dampfschiffs-Reederei accomplish a renewal of their fleet of conventional ferries with the newbuildings UTHLANDE (2010), SCHLESWIG-HOLSTEIN (2011) and NORDERAUE (2018). NORDFRIESLAND and SCHLESWIG-HOLSTEIN approaches Dagebüll, while UTHLANDE is on route from Amrum to Föhr in the background (2018). Above: RUNGHOLT passes Föhr on her direct midday connection between Amrum and the mainland (2010). The beach of Wyk auf Föhr (2010). Dagebüll features a rather complex terminal with its own train station (2018). Funnels on a row and a kite on a dark sky. (2010). The German research vessel COMET off Amrum. (2018).